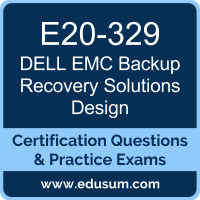 We have designed Dell EMC Backup Recovery Solutions Design practice exams to help you prepare for the E20-329 certification exam. This practice exam provides you with an opportunity to become familiar with the question topics and formats found in the actual Dell EMC Certified Specialist - Technology Architect - Backup Recovery Solutions (DECS-TA) exam. It also helps you identify topics in which you are already well prepared and topics on which you may need further training. We have composed questions for this Dell EMC E20-329 practice test by collecting inputs from recently certified candidates and our community users. We have rigorously maintained the topic weights, passing score, exam duration and question format in our mock exam as per the E20-329 Dell EMC Backup Recovery Solutions Design for Technology Architects certification syllabus. Simply, our Dell EMC DECS-TA practice exam builds readiness and confidence for the E20-329 certification exam. To get familiar with our online practice test platform, we request you to try our sample Dell EMC Backup Recovery Solutions Design certification practice exam. The sample practice test is designed to help you understand the nature of real E20-329 exam environment. The sample practice exam covers the basics of Dell EMC E20-329 certification exam. To evaluate your readiness and assess your subject knowledge with real-time scenario based question-answers, we strongly recommend you to prepare with premium Dell EMC Backup Recovery Solutions Design certification practice exam. We offer the most convenient way to prepare and pass your Dell EMC Backup Recovery Solutions Design for Technology Architects certification exam by providing practice tests with following features. Why should you choose us for Dell EMC E20-329 practice exam? We are a user driven community (for the users, by the users). Our community members who have cleared their Dell EMC DECS-TA certification test contribute to making practice exam updated with latest questions. To ensure you clear your E20-329 certification exam at first attempt, we regularly update the premium question bank by collecting inputs from recently certified candidates, certified community members, and Dell EMC Backup Recovery Solutions experts. Active contribution from our certified community members and Dell EMC Backup Recovery Solutions experts enables us to provide most updated and relevant practice exam questions. This proven process gives us the confidence to provide 100% satisfaction and money back guarantee. Our online simulated practice exam is designed to educate candidates about the skills needed to pass the Dell EMC Certified Specialist - Technology Architect - Backup Recovery Solutions (DECS-TA) exam, as well as persuade them to think outside the box and see the bigger picture. This has proven to be a very reliable and successful method of learning compared to sample questions PDF and exam dumps. Your E20-329 practice exam results are important because your success is important! You can use test results to identify your ineffective areas and focus on it will help you reach your Dell EMC certification goal more quickly. The result history helps you track your progress as you proceed. Why study and practice Dell EMC E20-329 exam with the sample test? This platform is designed to simulate E20-329 certification exam to provide the best environment for you to test your knowledge and get used to exam format. Here you are free to make mistakes, learn from them, and apply the learning before going out for the real Dell EMC Certified Specialist - Technology Architect - Backup Recovery Solutions (DECS-TA) exam. To achieve the best result in Dell EMC Backup Recovery Solutions Design for Technology Architects, you need to experience the types of question you will be asked to answer and prepare for the E20-329 exam online with the best practice questions from each and every topic. The time management has a vital role to play not only during preparation but also during the exam. You need several practice sessions to become comfortable with the timed test environment and make yourself ready for the real Dell EMC E20-329 certification exam. Our online Dell EMC DECS-TA practice exam platform generates an in-depth result for each test to help you understand your areas of strength and weakness in each mock test. This process helps in improving your performance level as you proceed. We all are different and have different ways to prepare for the Dell EMC Backup Recovery Solutions Design exam. Time yourself and develop your exam techniques is the best way to proceed. To identify the preparation mistakes and keep yourself on the right path, you need regular practice with E20-329 mock exam in a simulated test environment. Last but most important! You want to pass Dell EMC Certified Specialist - Technology Architect - Backup Recovery Solutions (DECS-TA) exam to get your dream Dell EMC Backup Recovery Solutions Design Job and earn more money with high Dell EMC DECS-TA Salary. Getting certified is not enough, you need to have an in-depth understanding of all the Dell EMC E20-329 syllabus topics and knowledge of business scenarios to use them. Our practice test provides perfect opportunity with real-time scenario based questions to improve your knowledge. I was weak in performing backups in EMC Data Domain Solutions Design and NetWorker Solutions Design but after giving mock tests on the site for ​E20-329 certification exam i got a way to work on my week subjects. It gave me more confidence and I performed well in actual exam. Personalized result book, result history, lowest price and free updates made me choose this site for paid mock tests online for DELL E20-329 practice. I was more than satisfied as i was given all the features. This is the most trustworthy site and very safe and secure. I scored 93% in DECS-TA exam, thanks to the practice i received on this site. I prepared my DELL EMC certification exam on edusum.com. This site is the best resource to nail the EMC Technology Architect Backup Recovery Solutions Specialist Certification. I explain in short why i chose this site above everything else. If you want to practice for dell emc exam, then this is best site. Do not lack on practice, as it is the secret to win the exam. I received 86% in the actual exam as i practiced mock tests on the site. The premium tests have more than 365 practical and real time scenario based certification questions. These questions are quite similar to the real exams. What i liked the most was the results that have correct answers that helped me in assessment. I am sure that aspirants who are serious to give their best will choose this site for preparation. I do not believe this! Pinch me! I have cleared DECS-TA E20-329 at very first attempt today. My score in backup recovery solutions design certification is 79%. This all happened when my friend suggested me paid test stimulators available online on this site. It transformed me as a person too. I was lazy earlier but giving mock tests interested me and also made me more knowledgeable about the topics. Backup Recovery Solutions Design mock tests helped me pass the actual exam.